For as long as I can remember, and that's more than half a century, Christmas trees have been the centre of our family celebrations. I don't mean the sort of thing made of plastic or tinsel bought in a shop and stowed in a cardboard box till next year, when it gets pulled out to be re-erected only to discover one of the brown plastic legs, patterned with something that's supposed to be wood grain but looks more like the aftermath of a monster beetle attack, is missing. Invariably these things get stored till next year, but when next year comes, they look like last year's model, so they get replaced by a newer, shinier version which in turn gets stored till next year. Anyway I don't mean that sort. 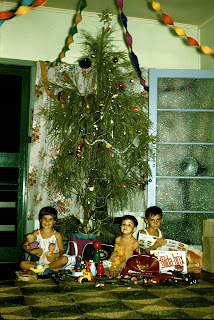 Our Christmas trees were always real. When I was a child they were erected on Christmas Eve and they were huge. They mostly reached almost to the ceiling, which for someone who doesn't reach to a table top is a very long way away indeed, and of course we'd all help to decorate it using boxes of decorations carefully preserved from year to year. Usually this happened pretty much straight after Mum had finished cleaning the chook ready for dinner the next day. I'm sure there was the odd squabble over who put what where, but in the context of world peace, they were insignificant. There was a special tinsel star which always adorned the highest bit, and Dad always checked the lights and had the job of stringing them up. One year he even fitted a gadget to them which made them blink. They weren't just erected on Christmas Eve though, they were STOLEN on Christmas Eve as well. Fifty years on, I still have vivid memories of the guilt and fear in my heart as I'd wander into the bush with my father to "steal" a tree, hoping no-one would hear the thud of the and the axe, (which had been used earlier to despatch the Christmas chook) and the heart-pounding relief as we made our getaway. I never felt safe until we were well and truly home, and the tree was hidden properly in it's bucket of sand in our living room. We don't have a lot of conifers in Aus, actually if one was to count the number of species growing naturally one could pretty much do that on the fingers of one thumb, and we certainly had none in the areas in which we lived, so our tree was always of the Casuarina species, commonly called She-oak. It always did occasionally seem a little odd that our Christmas tree didn't look anything at all like the ones in the Christmas cards, but I suppose I took some consolation in the fact that many of our friends had trees constructed from an even more motley collection of Eucalypts or Malleluecas. When I was a child, our trees were always the best. There was something very, very special about them that went beyond childhood imagination. The Casuarina has a rather bland, unspectacular form, with flowers that could be mistaken for leaves, but when lopped and placed in a bucket of wet sand, produces a spectacular sweet aroma. It smells of Christmas. We'd wake up Christmas morning, and the house would smell of Christmas tree with presents under it, and we'd know he'd been. The smell would be with us all day, and it would mix with the chook and pudding and Christmas cake, gently fading over the course of the day, to disappear by the end. Much later, our children lived with "real" trees too. Theirs weren't stolen, and the chooks were bought frozen in supermarkets so I had no need for an axe. The trees were great, maybe even spectacular, but they weren't Casuarinas and they didn't smell of Christmas. This Christmas morning, will be our first with a new generation present. I think as a special treat for the little bloke I'll do a bit of thieving. I think I'll try to recapture the fear, and recreate the smell of Christmas one more time. Even if no-one else understands. Even if they are happy to "make do" with the plastic and tinsel one we bought last year to decorate the place while we were away, I'll still do it. My tree will be special. My tree will mask the smell of the dirty nappies! I definately need a picture of your stolen tree. Don't forget, your children had one year with a National Park Tree- do you remember Stradbroke with the Hyndmans? Hmm the National Park was your grandfather's doing. Makes me wonder how I've stayed out of jail all these years really. The Tree is safely in our living room, carefully pruned so its parent won't suffer.